Arizona management: Get off my Lawn! A couple of years ago, the Arizona Diamondbacks curiously traded their #1 draft pick from the previous year (Trevor Bauer) for a package of players that centered on the underwhelming Didi Gregorius. I posted about the Bauer trade when it happened (Dec 2012) and, frankly, laid the blame at the kid’s feet for working his way out of town. This past July, the team traded starter Brandon McCarthy to the Yankees for a middling Vidal Nuno. McCarthy’s splits before/after the trade? He was 3-10 with a 5.01 ERA before the move, 7-5 with a 2.89 ERA after. And that’s moving to the AL East. The apparent reason? 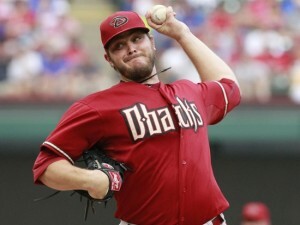 Arizona was actively discouraging him from using his effective cut-fastball. Why do I bring this up? Because, in the wake of the off-season Wade Miley trade to Boston … guess what? Nick Piecoro of the Arizona Republic reported that Miley and the Arizona training staff clashed in the past, and he thinks it led to his out-ster from the team. And then there’s stuff like this: Arizona management forced some fans sitting behind home plate to change their clothes in April of 2013 … and apparently just did it again. Arizona finished 64-98 last season, worst in the majors. Its no wonder they’re so bad right now, given the rate at which they’ve traded young, good, controllable assets for mediocre and expensive ones. They canned their entire coaching staff last off-season (aka, the “King of Grit” Kirk Gibson) and their GM (Kevin Towers) as a result, hiring Tony La Russa as their senior-most baseball executive and then Dave Stewart as their rookie GM. Perhaps the hope is that this new regime will stop openly clashing with its players and will value production on the field versus compliance in the clubhouse. Of course, Stewart didn’t help his case by plainly stating ignorance of analytics to the press this past off-season. And the new regime’s moves this past off-season didn’t exactly inspire confidence: their major move being the $68.5M signing of Cuban Yasmany Tomas, who apparently can’t actually play 3B and may start in the minors. And its hard to look at any of the slew of trades they made and say “wow, that was a winner move.” You almost have to wonder how they’re going to screw up the #1 pick in the 2015 draft this coming June. All the better for the rest of the NL West, which features two teams with very clear playoff intentions (LA and SD) along with a third (SF) who has only won three World Series in the last five years. post-posting update: Arizona has defended its forced uniform changing. Actually they provided an explanation .. it was just someone playing around. Sure. another post-posting update: Stewart essentially “sold” two players to Atlanta, including their 2014 1st rounder Touki Toussaint so as to rid themselves of Bronson Arroyo‘s deal. When questioned about the deal, Stewart was quoted as doubting Toussant’s velocity readings, saying that “Toussant didn’t throw 96.” And, as noted here, Stewart is right: Tousannt doesn’t throw 96; he throws 98. Toussant was well known to be mid-90s as a 16 year old two years prior to his drafting out of high school. And now Toussant is doing things like this: throwing 6 no-hit innings in low-A for his new team Atlanta. Thanks Dave! Yet another post-posting update: the organization left $1.7M on the table in the 2015 draft process, a ridiculously large amount of money, enough to buy at least 4 separate 3rd-4th round talents later in the draft. Just an amazing example of incompetence. And there’s more! Arizona was the sole team in baseball that didn’t make move at the Trade deadline in 2015, despite clearly being out of the NL West and despite having several players approaching free agency who would have made perfect sense to trade. Their main rumored interest was in Aroldis Chapman (a high-priced closer on a rebuilding team?) And, he threw the SD GM under the bus for his trade request … which was apparently mentioned in gest. 8/18/16 posting update: Keith Law absolutely kills the Arizona management with this take-down of the GM and President. And nothing in his article is really debatable. Both the GM and President have pending expiration dates on their contracts … and Law wonders if they’ll renew or start over. Subscribe to comments with RSS or TrackBack to 'Arizona management: Get off my Lawn!'. Trumbo has been a dud as well. There are many others. Couldn’t happen to a nicer bunch. Should I pause here to note the humble origins of the Nats’ current skipper? Nah, probably not . . . It does seem like an odd management group, and I expected no better when TLR took over and was shocked at Stewart’s hiring. But I don’t really fault them for Tomas, they are taking a gamble and Puig’s signing was widely criticized too. And they still have decent talent there, with Goldschmidt, Owings, Lamb, Pollock and the kid pitchers. Still, I wouldn’t feel great about things if I was their fan. Yes! This is one ownership situation that makes no sense, but the sad thing is that our manager comes from that fog. I know it’s only 7 games, but this has 2013 written all over it, and it’s not the injuries, it’s the leadership. KW – In fairness, Williams has a LONG way to go to match Gibson’s level of ineptitude . The old adage about managers getting too much credit for a team winning and too much blame for it losing doesn’t change the fact that he did right the ship last year (though admittedly the Nats having been putting on a 2013-like display of horrid play as of late). And thank goodness AZ let Rizzo go instead of promoting him–no one can argue that the his sharp drafting and trading has not been the key to the Nats going from worst to at least best in the regular season these past three years. But yeah, AZ is a dumpster fire. Having a bad owner, as indicated by the forced jersey change, is the worst thing when you’re a sports fan (hi there, Redskins fans!) because all you can hope is that they drop dead sooner rather than later. MW IS a dumpster fire and he was last year. He can’t manage a bullpen at all (Cedeno pitched today for the 4th time in 5 days – what???). You may have read about J-Zimm getting taken out of the 9th inning in a game last year. And, he kept guys like Hairston and Frandsen on the team all last year. And, yes, I think those were MW’s not MR’s decisions for bench guys. Meanwhile, MR has put together a roster that every pundit picked to win a lot of games. We have an all-time great rotation and few weaknesses. Sure, we have a few guys injured, but this hitting is the same as the NLDS. Why can’t our team handle pressure? It’s the leadership. MW is a dumpster fire. I’m with Andrew on MW. What did he see that no one else did to pitch Cedeno 4 times in 5 games. Another in a long list. McC: You know he’s pitched 3 of last 4 days, right? MW: Yeah, but we’re behind and it’s the 8th inning. McC: Yes, sir. I’ll get Cedeno up. Andrew–Williams may have influence over who sits on the bench, but that is ultimately Rizzo’s call. And as for the decision to take out Znn, if your closer can’t get one lousy out he shouldn’t be the closer. I’ll give him a pass on that one as well. Yes, his decision to bring in Cedeno on Sunday was a real head scratcher. Yes, for some reason this team went into the season looking not ready to play (although if a vet in his walk year like Desmond isn’t already motivated enough to play well, I hardly see where anything MW could say or not say would help). But it was not MW’s decision to sign Scherzer without upgrading the offense, nor to trade Clippard while leaving Storen as the closer, nor to go into ST with little or no depth and a lineup that features only two lefties. All of that is on Rizzo’s shoulders–as I said he’s been an excellent GM up ’till now, but if this thing implodes this year my blame goes first to him and then to MW. Karl, I think you’ll see Rizzo take back much of that responsibility this year. I agree it’s ultimately Rizzo’s call – I have a ton of confidence in Rizzo, so I think he’ll get this roster mgmt under control soon. I bet Rizzo had something to do with Clint getting some starts and that’s a good move IMO, especially because we’re so righty-heavy. However, it’s not the pitching (even the bullpen guys) that has been the issue. Storen will be fine and the other guys (except maybe XC) are very talented also. It’s hitting first, defense second. There is huge hitting talent on this team even without the injured guys. We need to score at least 3 runs every game with minimal exceptions. I’d rather make fun of them than think about how frustrated I am with the local nine. It’s hard to get fixated on the manager when the offense is so poor and the defense is so poor. Even the bullpen underperformance does not match the abysmal, abysmal offense (shades of October) and sloppy defense. I’m not calling Williams manager of the year, but you can’t hit for the players and you can’t field for a veteran team. fore– good point, but what is Espinosa doing in the lineup, again, against a righthander. He has, what 1,400 AB’s to show he’s terrible against them. When ESPN rated all the managers a couple of months back MW was #23. Was wavering between thinking that was about right or was overrated. Looks like RHP Rafael Martin has been called up from Syracuse. LHP Xavier Cedeno, who is out of options, is not on #Nats lineup card. Mark L – Espinosa. Basically, because Uggla is walking the plank. Rafael f’ing Martin. Thereby demonstrating the shallow age-ism of the prospect mayvens. Go get em, Beer League! Maybe the plan was just to use Cedeno until his arm fell off and then DFA him! Ugh. I’m surprised the call wasn’t to Grace to give another lefty in the ‘pen. I’m not happy about the Espinosa LH thing. With the HR now, there’s no way he’s going back. He never bought into it. He must enjoy life along the Mendoza Line. On Espinosa switching back … do you think the lack of capable lefty hitters on the team factored into it?